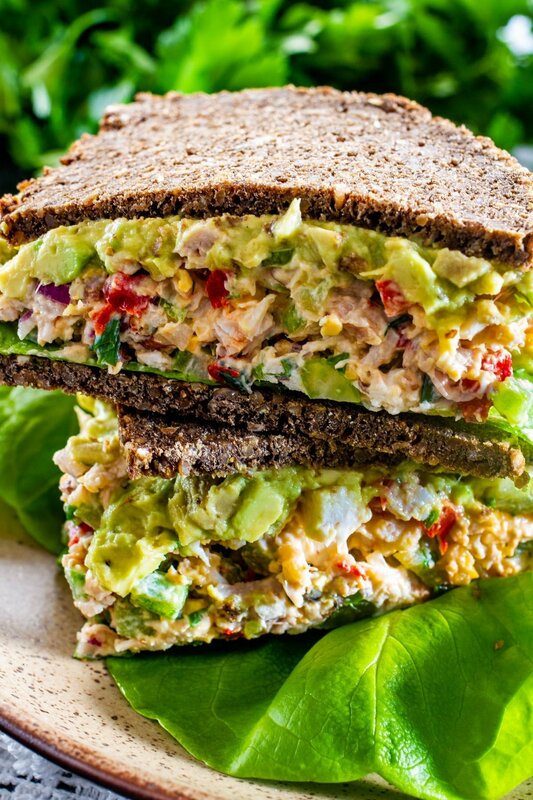 This Avocado Chicken Salad is loaded with so much flavor and made with healthy ingredients! It’s delicious, satisfying and perfect for a light lunch, brunch or dinner! This here my friends, is real chicken salad artistry! This is the best chicken salad sandwich you will EVER eat. Not that I’m biased or anything, but you must try this. It’s healthy, it’s satisfying and it’s perfect for sandwiches or just on its own. Over the years I’ve given you many recipes, way over a thousand actually. But I always have my favorites. Favorites that I make over and over again and this salad is one of those favorites. I love it because it’s quick, and it’s loaded with so many good ingredients, that it just makes me feel good when I eat it. I really hope you give it a try and let me know how you like it. 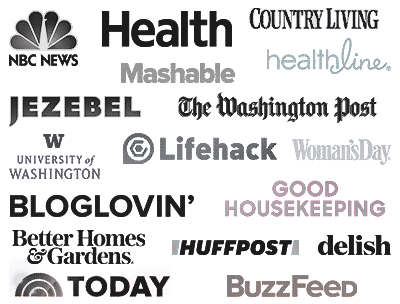 Chicken – I usually buy a rotisserie chicken and shred the breast meat from it. If you like dark meat feel free to use the thighs. Roasted red pepper – this gives so much flavor to this salad, a must for sure. Cheese – I love to use a good sharp cheddar cheese. 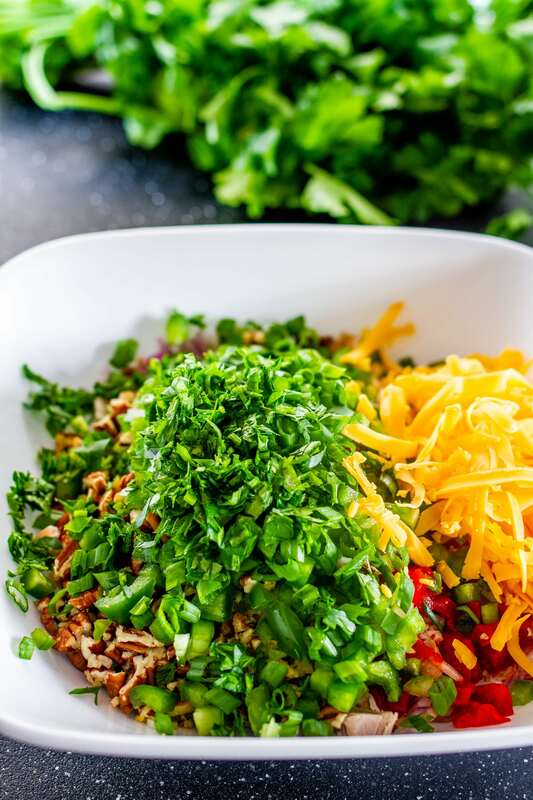 Veggies – you’ll need green onions, red onion, celery, and bell peppers. Load it up with lots of veggies. Avocados – the other star ingredient in this recipe. Pecans – these could be optional but I love the crunch they give the salad. Greek yogurt – you could use mayo but if you want this salad a bit healthier, use the yogurt. Salt & pepper – add as much or as little as you like to season to your taste. Lime juice – freshly squeezed. In a large bowl roughly mash the avocados, then add the lime juice and season with salt and pepper. Add the rest of the ingredients and toss well. That’s all there is to it! Chicken melt. Butter two slices of bread and spread chicken salad over the unbuttered side of the bread. Add more cheese if you wish then cook it in a skillet as you would a grilled cheese sandwich. On its own as a main course, perhaps with a side of fruit such as grapes. Transfer the salad to an airtight container, and place plastic wrap directly over the surface of the salad to prevent the avocados from turning brown. Refrigerate for up to a couple days. 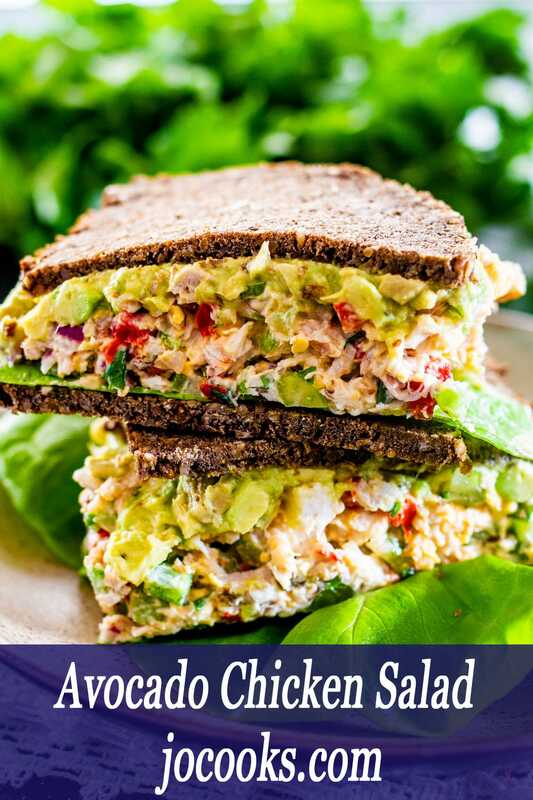 This Avocado Chicken Salad is loaded with so much flavor and made with healthy ingredients! It's delicious, satisfying and perfect for a light lunch, brunch or dinner! To the same bowl add the rest of the ingredients and toss well. Chicken: Use rotisserie chicken to save time. 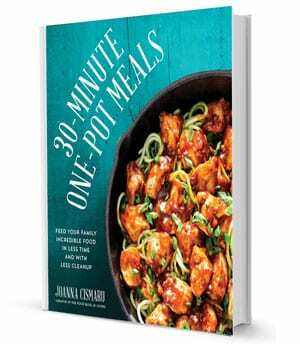 You could also cook your own chicken breast. Leftovers: Transfer the salad to an airtight container, and place plastic wrap directly over the surface of the salad to prevent the avocados from turning brown. Refrigerate for up to a couple days. Aww, poor baby! I hope she’s doing better! 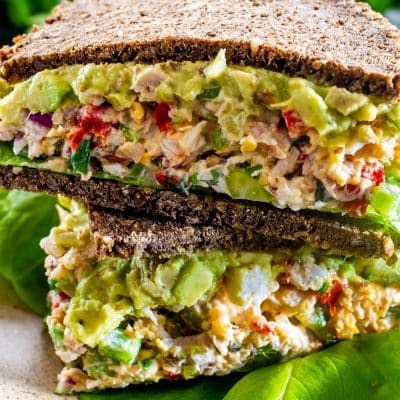 I’ve never thought of putting avocado on my chicken salad sandwich! You’ve just blew my mind…now I want chicken salad. Jo, your dog is so precious! I have some tips that might help her. I have a 12 year old dog & she is doing great. I put chicken broth or beef broth over her dogfood, add some olive oil too. I also make special people food for her, like blueberry pancakes from scratch with tons of frozen blueberries in them, I saute cabbage & kale in olive oil & add brown rice to it. Also make broccoli with coconut oil. She just had a vet visit last week & my vet says she will most likely live to be at least 15 years. I hope this helps your dog. Most dogfood doesn’t have any fatty acids or enough nutrients; especially for senior dogs. just wanted to share some things I’ve learned about my dogs. This chicken salad looks delicious! can’t wait to try it! This looks delicious and your pictures are great! Can’t wait to try it. Need to go to the store, as I don’t have all the ingredients. Your beagle is darling. I have a girl beagle also named Bo. She has health issues, and it is so upsetting. She is nine years old and we want her around forever. They are the best dogs, so sweet, kind and always happy! Now THIS is a sandwich! All that filling looks so incredibly delicious.. and the height of it is just WOW Jo! Well they are loaded, lol. If you don’t load them up so much you could probably get around 6 sandwiches out of this recipe. This looks like the BEST chicken salad sandwich I’ve ever seen! My 13 year old dog is my baby so I totally understand the senior dog situation. She is completely blind but otherwise healthy. So sad (and sometimes funny) to hear her bump around the house! I’m so happy to hear your pup is doing better! This looks like a beautiful meal. Could make a great salad without the bread. But looks great anyway you eat it. You’re right, you could eat it as a salad on its own, especially if you want to cut carbs. Up to you! Thanks Kathryn, she’s fine now, back to her normal self.